Chaiyo Hosting offers both Linux and Windows-based web hosting with massive bandwidth and scalable cloud hosting plans that will work for most websites. However, a lack of entry-level tools makes them unsuitable for beginners. Chaiyo Hosting is a Thailand-based web hosting company that’s been in business since 2004. They offer a solid selection of scalable Windows and Linux hosting plans. While they provide robust features, they don’t provide entry-level tools and aren’t recommended for beginners. I like the expanded developer capabilities of this service, which are rare with the Thai web hosting market and definitely indicative of a premium hosting service. However, it could be better. Python is a popular feature that’s not supported. They do have a WordPress toolkit that will allow you to manage all of your WordPress sites automatically though. I wouldn’t recommend this host for beginners. They don’t offer any form of entry-level tools such as a website builder or an auto-installer for most common apps like WordPress. Experienced webmasters will enjoy the developer-friendliness and agility of the platform, but beginners will have to learn new skills to use this product. Their prices are where their premium status is revealed: Chaiyo Hosting’s prices are on the high side, especially for a Thai hosting provider. Only their SEO Hosting plans are around the market average, though even then they’re still slightly pricier. If you’re going for their Linux or Windows shared cloud hosting plans, you can expect to pay quite a bit more. There are also a couple of things you need to be aware of with their plans. First, you don’t get a free domain, so you’ll have to factor that into your final costs. Also, they don’t offer free SSL certificates, meaning yet another charge on each website you host that needs a certificate. Chaiyo Hosting offers solid support offering live chat (though not 24/7), telephone, email, and ticketing support. Also, they provide a decent knowledge base and a fantastic tutorials section covering a wide variety of topics including advanced topics such as running Node.js in Plesk. Experienced webmasters will appreciate Chaiyo Hosting and their scalable options for both Linux and Windows. Beginners will either have to work on improving their web design skills or find a provider with entry-level tools. 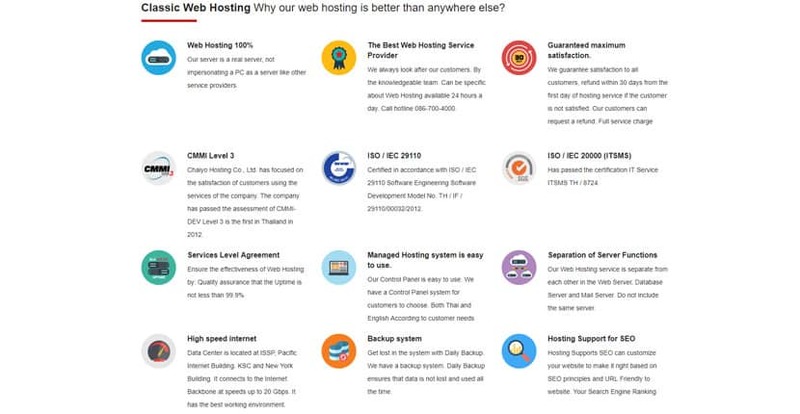 Wondering how Chaiyo Hosting stacks up against other Web Hosting companies? Enter any other Web Hosting company and we will give you a side-by-side comparison.